Men of Integrity will meets every 1st and 3rd Saturday morning of the month in the Lower Level of Our Shepherd Lutheran Church from 7:00am - 8:30am September through May. 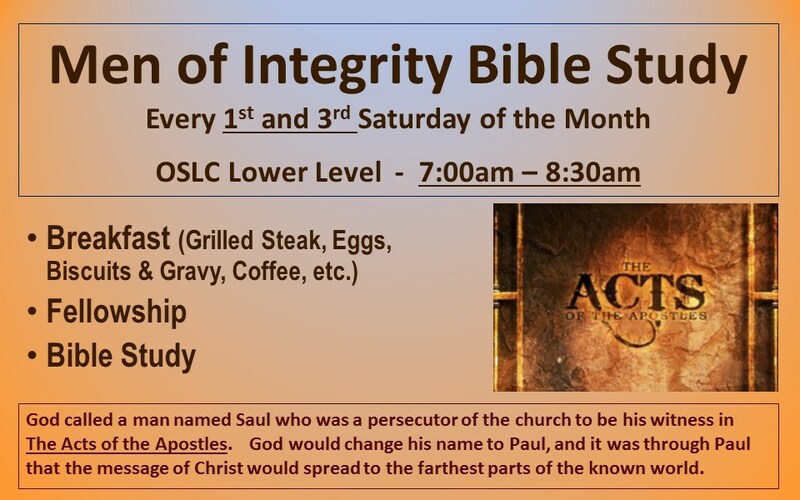 Enjoy a hearty breakfast of grilled steak or ham, eggs, biscuits & gravy, corned beef hash, coffee, and orange juice; fellowship; and a look into God's Word with an eye for life application. Currently studying The Acts of the Apostles. The Acts of the Apostles studies how the early church exploded with through the power of the Holy Spirit. We would love to have you join us! Led by Dr. Mark Nimtz. Contact Mark at nimtzm@ourshepherd.net.